KeyToUDP does principle what it’s name suggest. It catches key presses from a keyboard and send the captured keys via UDP. KeyToUDP can use three different protocols to do that. 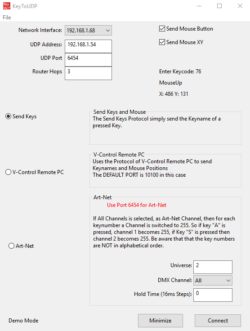 Send Keys, V-Control Remote PC and Art-Net. 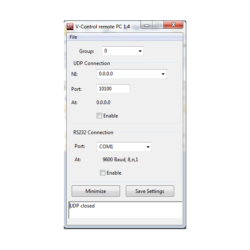 Use V-Control Remote PC to send keyboard and mouse commands to a computer connected by network. V-Control Remote PC can also launch applications or send shutdown commands. New in Version 2.0: Advanced PowerPoint support.